C Peter Waegemann, Vice President mHealth Initiative President Waegemann Associates LLC USA. Adoption of mDevices (cell phones, smartphones, tablets, and more) and their numerous healthcare applications (more than 5000 and growing) is expanding as the opportunities they present for improved quality of care, enhanced efficiency, and lower costs are increasingly recognized. This paper will explore the practical applications of mHealth and their impact on how health information is recorded, collected, accessed, and transmitted. The aim of this paper is to present results obtained in the context of the “Medical data acquisition, processing and collection for e health solutions” joint research project for investigation, design, organisation and future expansion of a hospital information system. The research started with deep investigation of current status of hospital information systems on the territory of the Medical University Sofia and implementation of pilot version of integrated solution. Elimination of the usual paper-based information exchange to e-health and IT-based one is one of the major project topics. Medical University Sofia is a huge hospital complex distributed on a large territory and has tens of different clinics, laboratories and buildings. 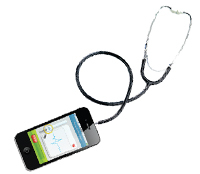 mHealth encompasses healthcare and wellness/fitness endeavors that are supported by mobile technologies. As it creates new communication patterns, mHealth represents truly revolutionary communication-enhanced healthcare and wellness. This mHealth revolution is advancing rapidly, facilitated by such factors as easy and simple access to the Internet and the healthcare community through mobile devices (mDevices) that are changing communication patterns. An increasingly trusted Internet has democratised access to healthcare information, as evidenced by the Pew Internet & American Life Project report in early 2011 that healthcare research is now ranked the third most popular web activity online, after email and using a search engine. Similarly, just as the public is increasingly turning to online peer reviews of movies, books, restaurants, products, and other items before purchasing them and no longer limiting themselves to “professional” reviews, consumers/patients are also seeking out opinions through public online discussions with their peers about healthcare providers, disease conditions, treatments, and medications. Of course, one does not need an mDevice to access information or participate in online public discussions, but what mDevices add to the formula is anywhere, anytime access for anyone with such a device and connectivity. No longer are consumers or patients limited to desktop PCs. With devices such as smartphones and tablets, they can respond immediately to a need or impulse to seek information, whether at the end of an encounter with the doctor, at home, when traveling, or wherever they are. Such access expands the meaning of connectivity. While the power of making and maintaining a connection between two or more points in a telecommunications system is essential, the real power of such connectivity in healthcare means that patients, practitioners, providers, payers, and pharma can be connected and can communicate directly in real-time, at the point of care or remotely. This has never been possible before. In turn, these expanding connections are expanding access – to care, to resources, to information, to experts. Through new voice, text, and image capabilities, such access is creating the path to a new style of communication-based healthcare. A review of these 12 categories of mHealth applications readily demonstrates the degree to which mobility is becoming an integral part of healthcare and how it is changing how healthcare is accessed, delivered, monitored, adapted, evaluated, documented, managed, taught, paid for, etc. These categories are not mutually exclusive, and, therefore, any single healthcare app may fit into one or more of these categories. Very likely, however, there is a primary category in which it best fits. Also of note is that the sequence in which the categories are discussed is not intended to reflect a hierarchy among them. Patient communication applications are used by the patient before, during, and following visits to their clinician, as well as for purposes unrelated to such visits. They assist patients, for example, in locating and selecting caregivers, in making and changing appointments, in accessing insurance information, in upgrading demographic data, in doing advance check-in, and in creating a PHR (personal health record) or CCR (continuity of care record). Through email, text messages, and instant messaging, patients can provide their caregiver with advance information regarding their visit and potentially be advised to have lab tests done prior to the visit. During visits, these apps facilitate patient education and financial and administrative transactions. Separate and apart from visits, they assist in disease management, including recording ODLs, observations of daily living. ODLs help the patient and the caregiver identify trends and influencers related to their condition, for example, circumstances under which certain disease symptoms are relieved or exacerbated. This cluster also includes applications that give patients direct access to information about their medications, their lab data, their diagnoses, second opinions, etc. Smartphones with cameras allow patients to communicate visually, for example, by sending photos of skin conditions, for example, or videos that demonstrate their gait. Additionally, these apps assist patients/consumers in monitoring their wellness and fitness activities. Other apps facilitate emergency communication, vital sign monitoring, and safety “fencing”, for example, for seniors. Resources are readily available through smartphones or other mDevices, not just through direct access to the Internet, but also through apps that provide customized access. For clinicians, these include formularies, guidelines and protocols, decision support tools, telemedicine guidelines, medical journals and texts, access to patients’ PHRs and patient directives, and information about patient eligibility. They can also be used as personal assistants. From the patient perspective, web resources facilitate their researching symptoms, diseases, and treatment, as well as medications and lab data. These apps give them access to sites where they can communicate with other patients who have similar diseases, surgery, and other experiences. And increasingly, they provide second opinions, as more and more patients turn to the web in order to compare and confirm information that their physician provided. The most researched health topics online in the US are specific diseases or problems, specific medical treatments or procedures, exercise and treatment, doctors and other health professionals, and prescriptions as well as over-the-counter medications. Furthermore, patients incorporate web-accessed information into their office visits with caregivers, as well as through eCommunications between visits. To what degree clinicians respond to this information and to what degree they document the data in patient’s records is, for the most part and at present, left to their discretion, but it is expected that increasing attention will be given to incorporating web-based and app-based information into a patient’s record, particularly if it is utilised in offering the patient options or in making treatment decisions. Indeed, some clinicians are beginning to “prescribe” Internet searches and specific mobile apps, and certainly such “prescriptions” should be documented in the patient’s record. 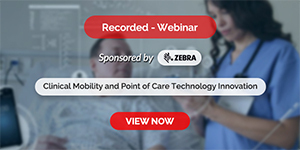 Point-of-care (PoC) documentation apps allow clinicians to access, document, transmit, and navigate patient-specific information in real-time, whether at the PoC or remotely. This means clinicians no longer need make treatment decisions blindly, without access to the most current and relevant information about a patient’s condition and treatment. It also means that patient documentation entered on the mobile device must be communicated to and integrated into the patient’s electronic or paper-based record. Real-time documentation requires particular attention to accuracy, authentication, interoperability, and security. Managing this requires cooperation among the clinicians, the health information services personnel, and the health record managers. It also requires timely attention in order to assure that the information being accessed is indeed the most current information. Furthermore, health IT personnel must assure that any protected health information (PHI) stored on and transmitted through such devices assures privacy and security. The current focus of disease management apps for clinicians and patients is on diabetes, asthma, dermatology, preventive care in pregnancy, smoking cessation, and hypertension. Patient data, such as ODLs mentioned earlier, are sent directly to the caregiver, thus providing continuous rather than periodic monitoring and stimulating more timely intervention. This requires that systems must screen incoming information along the spectrum of routine to emergent and direct messages accordingly. Some apps provide diaries and opportunities for self-observations, which may or may not be shared with the caregiver. Other apps provide prompts when lifestyle changes result in improved readings. Such data collected over time must be aggregated in order to monitor and manage the patient’s signs, symptoms, care, and treatment. Education apps support professional teaching, monitoring, coaching and on the job training, as well as teaching patients self-care, self-monitoring, and about diseases, conditions, medications, etc. Some medical and nursing schools offer student evaluations and reviews of instructors and texts, as well as course content, through such apps. Other apps offer education and training, along with self-assessment tools. Still others enable participants in widely scattered locations to share educational activities and data and to view videos and have discussions in real-time. As noted above, those apps that involve patient education should likely be referenced in the patient’s record if they are '“'prescribed' or recommended by the clinician. Professional communication apps provide preferred communication channels for healthcare professionals, lab, pharmacy, internal departments, etc. They connect colleagues for team conferences and create specialty specific communities and professional networks, where experiences can be shared and expertise tapped. Some of these enable a clinician to contact a specialist “on the fly” i.e. in real-time as they are assessing a patient with an unusual complex of symptoms or in emergency situations. Administrative applications include provider-payer applications related to financial, demographic, and nonclinical data. Also included are apps for appointment scheduling, self check-in, and reminders regarding appointments, medication refills, and lab reports. Other such apps facilitate both internal and external staff communications. There are also third party applications that connect healthcare facilities with payers, labs, and other providers. Also here are asset-tracking apps, for example, barcode scanning and RFID systems that facilitate inventory control for surgical instruments and equipment, even for mDevices themselves. Similar apps track paper medical records and facilitate patient flow management, for example, scheduling, admissions and discharges, and bed management. Financial applications enable real-time charge capture, as well as access to eligibility, coverage, and co-pay information. Some check ICD and other codes and send electronic bills. Through these apps, payers can actively communicate with patients and providers and perform online real-time adjudication. Some also process payments by phone. To assure proper management of financial data and transactions, these must be linked to in-house financial systems. With ambulance and emergency medical services apps, emergency service providers are collecting patient information while en route to the emergency department and communicating such information in advance of arrival, thus facilitating faster, more informed triage and treatment. Some apps enable the emergency service providers to access a patient’s PHR or CCR and to identify and contact the patient’s primary care provider. Utilisation of these apps requires design and implementation of a system that assures that patient information so collected and communicated is incorporated into the patient’s record. Public Health apps facilitate reporting and managing disease outbreaks, disasters, and bioterrorism. These can send alerts to providers and notify populations of pending or occurring public health incidents. They facilitate surveillance and reporting and enable instructing the public at large. Public health apps are seeing increasing adoption, especially in developing countries where communication channels are otherwise not easily accessible, if at all. Pharma/clinical trial apps facilitate through automatic, scheduled, and ad hoc information transmission of data. By relying on the mDevice rather than the patient for data collection, they improve its quality and timeliness. Also of relevance are spontaneous or organized exchanges of information among patients. Those conducting clinical trials initially dismissed these anecdotal discussions, but their potential value is gaining increasing attention within pharma. Of course, data collected through formal trials must be accurately identified, aggregated, and integrated into clinical trial records and, where appropriate, into patient records. BANs are mobile wearable or implanted sensors that monitor vital body parameters and movements and wirelessly transmit data from the body to the provider or elsewhere via a home base. Examples include heart monitors to identify a potentially pending heart attack and BANs that auto-inject insulin for diabetes patients. Also represented here are sports activity apps for monitoring speed, distance, heart rate, blood pressure etc. A big issue with BANs is security, and of course data transmitted to a patient’s healthcare provider through BANs requires both interpretation and integration into the patient’s medical record. As evidenced above, mHealth is not just changing the delivery of healthcare but also the management of health information and records. Management and policy guidelines must be revised or newly developed that address their wide variations in content, relevance, and immediacy. Further, authorized apps and device-captured information must be integrated into the health information system without distortion or loss of data. Good and secure identification systems must be linked to and integrated into the patient’s record, whether it is electronic or paper-based. The volume of communications through such applications requires determining just which are administrative and which are clinical. Furthermore, systems must be developed that determine how and when and by whom such data are reviewed and acted on. A healthcare institution could potentially receive hundreds or thousands of text messages and emails from patients. These require sorting into those that can be handled by canned, standard responses, those that require timely and customised but non-urgent responses by a health professional, those that allow time-flexible responses, and those that require immediate attention because they represent urgent and emergency communications. Additionally, issues, such as patient consent and patient preference, must be taken into consideration when using these apps, as well as when using text messaging and email in patient communications. Strict regulations that apply to all personnel and associates, not just employees but also volunteers and contractors, must assure that there will be no unauthorised use of camera or video capabilities of mDevices. Clinicians and others may need tutoring regarding the professional and safe use of smartphones, tablets, and other mDevices. Wireless communication security must be implemented and connectivity must be guaranteed. The security and privacy of patients’ personally identifiable information must be assured, whether the information is accessed on, entered into, or transmitted from mDevices. That is, the information must be protected whether it is stored on such devices or transmitted to and from them, and access to such devices as well as such data must be restricted to those authorised for same. It is especially important that all stakeholders involved be prepared to address these issues openly and with a willingness to be innovative. The appropriate starting point is not asking “how can we fit these new technologies into our existing systems,” but rather asking “how can we use these new technologies to improve or replace our existing systems and make them less burdensome for clinicians and patients, as well as more efficient and effective and less costly in delivering care.” The fact that these questions have not been widely asked in reference to electronic medical record (EMR) systems has contributed to both their deficiencies and their limited adoption. mHealth , as a disruptive technology, provides new and important opportunities to improve the management and delivery of healthcare, as well as the management of health information and medical records. Claudia Tessier is an internationally recognised expert on mHealth, healthcare documentation, PHRs and the CCR (continuity of care record), is founder and president of mHealth Initiative, a membership organization based in Boston Massachusetts, which promotes adoption of mobile technologies in healthcare as the catalyst toward participatory health. Her previous positions include vice president of Medical Records Institute, executive director of MoHCA (Mobile Healthcare Alliance), and CEO of American Association for Medical Transcription (AAMT). She is the author of The Surgical Word Book (Elsevier 2005), The AAMT Book of Style for Medical Transcription (AAMT 1995) and most recently, Management and Security of Health Information on Medical Devices (AHIMA 2010).